There were other messaging apps before Whatsapp, but the Silicon Valley based service was the first with a reliable app: Not loosing messages, always assuring that push notifications arrive, an app that doesn’t often crash, etc. Its early competitors struggled with these challenges, while Whatsapp delivered a performant and stable service. With 15-20 billion messages being delivered per day, this is actually quite an achievement. In consequence the customer satisfaction has been high. Having started with the iPhone, Whatsapp quickly launched its app on other platforms. Blackberry was second, and then quickly came Android, Nokia (with Symbian 60 and even 40), Windows Phone, etc. The platform reach gave Whatsapp a considerable advantage over its competitors, and the resulting network effects among its users helped to accelerate the growth. Since Whatsapp accesses the user’s address book to automatically connect friends, the whole setup of the service has become very easy for users. Traditionally on other services, users had to manually find and connect friends (e.g. Skype, Facebook, Linkedin, etc.). Needless to say, many people don’t like that their address book is copied to the servers of a company. However, the benefits of the automatical synchronization and the resulting ease of use beat possible privacy concerns. Again the results have been strong network effects and growth. Whatsapp made it really easy to send many messages in a row. To a certain degree Whatsapp even changed the messaging behavior of users a bit. Before users wrote several sentences and then sent one complete SMS message. Now they simply press “Send” for every sentence. For teens who send hundreds of messages per day, this has been perfect. If Whatsapp is able to keep its lead, remains to be seen. Many competitors have catched up, and there are certain use cases where users demand advanced features, because the app is not good enough anymore. However, so far Whatsapp is a great success story with 430 million users. The Blackberry Messenger (BBM) was originally the first big messaging app on smartphones. It came pre-installed on all Blackberry devices, and was a key sales proposition for business users as well as for many consumers. Basically 4-6 years ago the BBM had the success that Whatsapp, Line, Kakao Talk and WeChat have nowadays. Some 60-80 million people once regularly used the BBM. 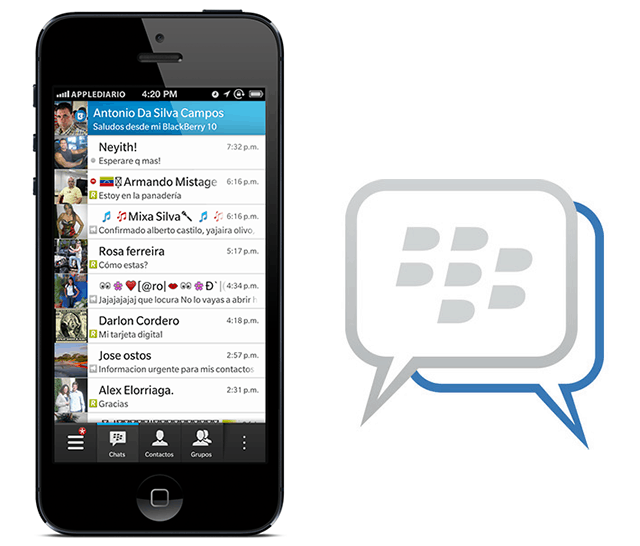 A week ago the BBM for iPhone and Android was finally launched. Generally, it is a fairly basic messaging app and similar to the popular apps out there. One difference is that it doesn’t connect users by syncing the address book contacts. BBM mainly works with the Blackberry ID, and thus is probably mainly for users with Blackberry friends. Since the Blackberry platform is on the decline though, the demand will probably be limited. 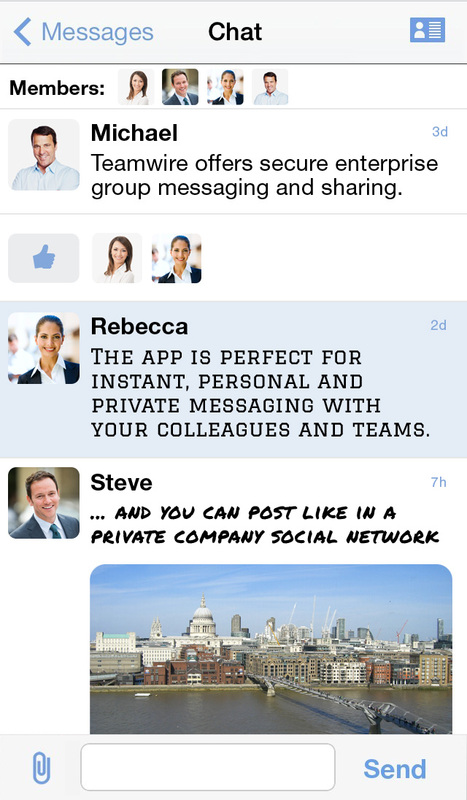 In addition to simple chats, users can set up group chats. The groups are pretty much standard, except that you also can create events. So they are a bit like Facebook Groups. As digital content you can send voice (push-to-talk) messaging and photos. However, so far there are no videos or stickers. Besides things like calendar or contact sharing which would be compelling to business users of the BBM are missing. The user interface is pretty straight forward, but they could have reduced and simplified the number of tabs. As well from a design perspective, there are definitely prettier messaging apps available. This iOS and Android version seems like a first launch effort and so far there is nothing groundbreaking. In comparison to the leading messaging apps the BBM looks a bit old. Apps like the new BBM were state-of-the-art in the market about 2-3 years ago. Now most apps move into better personalization, stronger self expression and advanced content sharing with games, music and much more to come. Overall, the launch of the BBM comes too late. Looking at current group messaging apps, one can see two approaches to sharing with personal groups: Groups and lists. If one takes a closer look, it becomes clear that one or the other are clearly favorable for certain group messaging use cases. Groups are the traditional approach, which emerged from group chats in instant messaging apps. A group is defined by one user, who invites several members to join, and then starts the chat. The group can be given a name (e.g. soccer team or saturday night dinner), and then all members can write messages in this group chat. Groups are good for quick coordination, or for simple messaging and sharing where the members don’t change and the communication is unfrequent. Since a group has one single chat only, the disadvantages become obvious: If the topics in a group chats change, it can be very difficult to follow the conversation. Imagine the same group chat with your family, where you brother wants to coordinate a bike trip tomorrow, your mum wants to coordinate dinner for tonight, and your dad wants to share that he bought tickets for a basketball game. Basically the different conversations will get interrupted by each other, and it will not be clear, what topics the answers of the family members refer to. Or – but also not very compelling at all – each family members waits till the communication for the last topic has been finished. Any other examples like sharing moments, photos or locations which create new topics in a group chat can be equally interrupting to a previous topic. Another critical thing could be confusing group names. If two or more friends set up a group “Friends”, because they each want to message and share with their friends, I will see several groups “Friends” in my app. From a usability point of view this takes time, and leads to miscommunication. Lists arose from email and social networks (e.g. Google+). A user defines a list (e.g. family, best friends, colleagues), and then simply writes to that recipient list. There is no need for recipients to permanently join. Recipients receive the message and can then reply in a group chat. The benefits of lists are clear: For every new event that you want to coordinate, topic that you want to discuss, moment that you want to share, location that you want to post, photos that you want to exchange, etc, you can simple start a new group chat with the people you choose. Thus, you avoid overlapping conversations of different topics, that would typically happen with groups as described above. Since group messaging apps using lists often work with posts like a social network, these apps are often better and much nicer for personal sharing with groups like family and best friends. The user sees truly personal posts, and not another message in a group chat. Besides apps with lists often have very visual feeds, where the user also needs less clicks to access content. Most messaging apps currently offer groups. Examples are WhatsApp, GroupMe, Line and WeChat. There are not many messaging apps that work with lists. The most prominent and also one of the best group messaging apps currently available is Grouptime. Lists need to be set up by each user (for some it might be more comfortable to only having to join a group), but overall they are probably better for group messaging and sharing. The more experienced users get with group chats, the more they will see the many limitations of traditional groups. The future probably belongs to lists.